A detailed replica of the famous TV car (which was named the Monkeemobile), this 1966 GTO is street legal and is powered by a Pontiac 400cid motor. 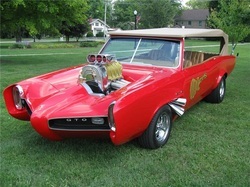 Even though it’s not the real deal, this car has picked up several awards and has been signed by the Monkees. Sporting a bright red exterior, a Monkees gold guitar logo decal and a tan interior, this GTO looks so authentic, it will make you a believer. Interested in buying it? You’re in luck – the 1966 Pontiac GTO is up for auction through Barrett-Jackson. The auction takes place during the Scottsdale, AZ event on January 15 to 22. You can find out more about the car and the auction on Barrett-Jackson’s website.